Papers: 1779-1817. 19 items. Letters and documents. Additional Papers: Correspondence in the Jay family papers, 1828-1943; typewritten copies of letters between Burr and Alexander Hamilton and their seconds, preceding their duel, in Frank Monaghan papers, ca. 1930-1935, 1954-1955, 1960; and in Alfred C. Berol collection, 1650-1830. Papers: 1765-1833. Ca. 100 items. Letters and papers, chiefly relating to Burrs law practice. Also 31 items of miscellaneous legal papers, several in the case of Burr vs. Richard Edwards, 1801-1818. Additional Papers: Legal brief (September 10, 1812) stating the case against the Fulton-Livingston steamboat company; 6 items (1782-1787) in Jeremiah Wadsworth papers; 2 items (1795) in Oliver Wolcott, Jr. papers; 1 letter (February 21, 1790) in Hoadly collection; 1 letter (September 23, 1792) in A.L. Butler autograph collection; and 4 items (1782, 1783, 1833) in Wadsworth Atheneum loan collection. Papers: In the Washington Irvings Life of George Washington, Volume IV, Miscellany, 1756-1807; Volume IX, Miscellany, 1766-1808; and Volume XII, Miscellany, 1769-1838; and in Wadsworth family papers, 1792-1803. Papers: Personal correspondence in Reeve family papers, 1767-1866; and correspondence in Roger Minott Sherman papers, 1760-1848. Finding aid. Papers: 1784, 1814. 2 letters. Plus references in various collections. Papers: 2 promissory notes; 2 deeds; and 2 business letters (March 4, 1784 and August 12, 1785) to the sheriff of Orange County. Papers: In the Victor du Pont papers, 1753-1847; Pierre Samuel du Pont de Nemours papers, 1757-1836; Eleuthera Bradford du Pont collection, 1799-1834; and The Papers of Benjamin Henry Latrobe, 1788-1820, a microtext edition published for the Maryland Historical Society on 315 microfiche. Papers: 1 notebook on Burr (1855) in James Parton papers, 1835-1966. Finding aid. Papers: 1808-1812. 1,257 page diary. Also correspondence and papers (1797-1826) relating to a protracted litigation relating to Burrs indebtedness to Louis Le Guen. Papers: Correspondence in the Charles Biddle papers, 1763-1829; Clement Biddle papers, 1743-1835; Simon Gratz collection, 1677-1910; Pennsylvania Population Land Company records, 1792-1834; Daniel Parker papers, 1800-1846; Coxe family papers, 1638-1897 (bulk 1776-1879), available on microfilm; and the Henry Drinker papers, 1747-1867. Papers: 1 letter (August 3, 1821) in Bookfellow Foundation autograph collection, 1705-1940. Papers: 1788-1824, 1827. 25 items. Also 1 container, 1806-1808, of Burr conspiracy records. Available on 1 microfilm reel. Additional Papers: Correspondence in Benjamin Homans papers, 1796-1840; Samuel Chester Reid papers, 1807-1963; William Wirt papers, 1802-1858; and material concerning the trial of Burr in Albert Gallatin papers, 1783-1847. Papers: Personal letters in Brooklyn Letters collection, 1814-1976. Papers: Ca. 90 items (ca. 1779-1833) in various collections. Finding aid. Papers: Correspondence in John Langdon papers, 1762-1972. Finding aid. Papers: Items in National and Local Historic Figures collection, 1638-1980. Papers: 1755-1836. 13 items. Letters and narratives by and about Burr. Includes letters of Herman Blennerhasset and Matthew Livingston Davis. Finding aid. Additional Papers: Correspondence in De Zeng family papers, 1729-1925; Walter N. Eastburn collection, 1743-1956; and William Paterson papers, 1833-1897. Papers: 1774-1836. Ca. 2,000 items. Dockets, writs, leases, and correspondence. Additional items in various collections. Papers: [ca. 1780-1880]. Letters, clippings, legal documents, and engravings of portraits. Additional Papers: Correspondence in Caesar Rodney papers, 1749-1823; William Edgar papers, 1750-1870; and Jones family papers, 1695-1876. Papers: 1804-1809. 34 items. Chiefly Burr correspondence relating to his duel with Hamilton. 4 additional items in Miscellaneous manuscripts B, 1793-1979. Papers: 1781-1830. 70 items. Includes letters, documents regarding cases in chancery (1795, 1812-1816); and receipt book (1812-1821). Additional Papers: Correspondence in the Henry Rutgers papers, 1730-1875; Wadsworth family papers, 1787-1860; Phelps and Gorham Company records, 1776-1892; and others. Papers: Correspondence in Arthur St. Clair papers, 1763-1870. Papers: 18 items (1770-1834); and 9 letters (1792-1807) on various topics and 1 document (ca. 1835) concerning divorce petition in the Gilder Lehrman collection. Finding aid. Papers: 1770-1836. Ca. 700 items. Correspondence and other papers. Papers: 5 letters (1771-1787); and 14 boxes of material in the Charles Felton Pidgin Aaron Burr collection, ca. 1800-1810. Papers: Material collected for book, Staten Island and Its People, in the William Thompson Davis collection, 1851-1858. Finding aid. Papers: In United States Circuit Court, Ohio District records, 1805-1808, photocopies from originals in the Naitonal Archives. 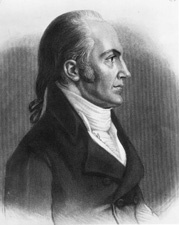 Chiefly indictments, affidavits, summonses, bonds, letters used as evidence, and other papers pertaining to the trial of Aaron Burr and Harman Blennerhassett for treason. Finding aid. Papers: In the Tucker-Ewell papers, 1770-1893; and Tazewell family papers, 1772-1866. Papers: In Joseph Buell papers, 1806-1811. 41 items. Correspondence, notes, property list of Harman Blennerhassett, and other papers relating to the Aaron Burr conspiracy and the seizure and confiscation of Burrs ships and property. Finding aid. Papers: 1757-1836. 27 microfilm reels. Includes correspondence, public papers, orderly books, journal, and legal papers. Published finding aid. Additional Papers: Items in the Burr family papers, 1750-1853; Aaron Burr microfilm collection, 1771-1903, on 1 reel; Humphreys-Marvin-Olmstead collection, 1776-1867; Edwards family papers, 1805-1874; Reeve family papers, 1766-1813; Henry Dearborn microfilm collection, 1801-1812, on 1 microfilm reel; Jeremiah Mason papers, 1798-1844; and Lefferts family papers, 1712-1936 (bulk 1712-1850). Research Libraries Information Network In addition to the institutions listed above, items are also cataloged in collections at: American Philosophical Society Library, Philadelphia, PA; Brooklyn Historical Society, Brooklyn, NY; Chase Manhattan Corporation Archives, New York, NY; Dartmouth College, Hanover, NH; Emory University, Robert W. Woodruff Library, Atlanta, GA; Franklin D. Roosevelt Library, Hyde Park, NY; Harvard University, Houghton Library, Cambridge, MA; Huguenot Historical Society, New York, NY; Kentucky Department for Libraries and Archives, Frankfort, KY; Museum of the City of New York, New York, NY; New York Society Library, New York, NY; Rosenbach Museum and Library, Philadelphia, PA; Senate House State Historic Site, Kingston, NY; Stanford University Libraries, Stanford, CA; University of Rochester, Rush Rhees Library, Rochester, NY; University of Virginia Library, Charlottesville, VA; and others.